This is a 5-column version of Zonx's 66% bags for Fetish Nightfall. 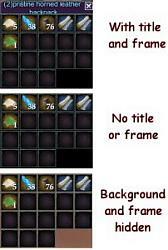 Icons are reduced to 28 pixels, thus compressing the bags significantly while still being able to easily tell what's in them. The mod is coded for a max bag size of 40 slots. I don't know if there are any larger bags than that (the largest I have is 36 slots). If anyone runs into a problem with this, let me know and I will see about adjusting the window size. Theoreticaly those box are X5 but they still use the height of the X4 ones. OK, figured out what you were talking about. For some reason, it was cutting off the height on smaller boxes so you couldn't access a few of the slots. I changed the mod to be user resizeable, so you can expand the window to display all your slots. Hope that helps and thanks for the heads up. Last edited by Ertoocs : 11-25-2006 at 10:22 AM. Sorry, can't find you in the released forum...I really like this, installed it per your instructions, but my bags still are the same. Any ideas what I can do? Thanks for your help and all the time you put into this. As long as you're renaming the file correctly and putting it in your fetish folder (and not doing anything else that could be overwriting the file....ie. using the Fetish Customizer), it should work fine. There's not really much to it, so I'm sorry if I don't know why it wouldn't be showing up. You may want to try unlocking your windows and rearranging them. Depending on how you had them layed out previously, you're bags may simply be overlapping.